The living room is artfully set against a backdrop of floor to ceiling windows. Not only does this, flood the suite with pure, natural light, but it also provides guests with a wonderful view of a picturesque courtyard. 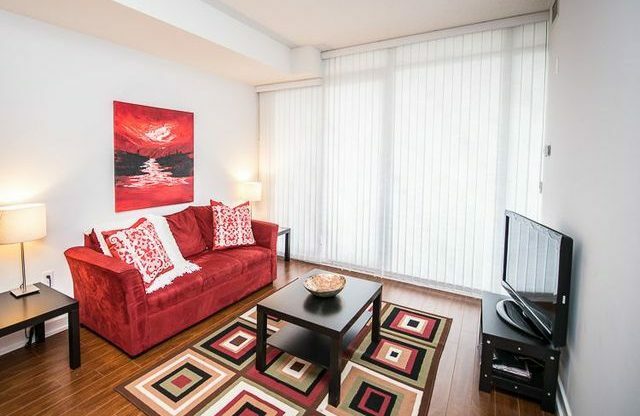 The room is finished with a plush red couch, dark wood coffee table, and flat screen TV. Relax here after a long day at work, or enjoy a movie night with your access to Rogers VIP cable. 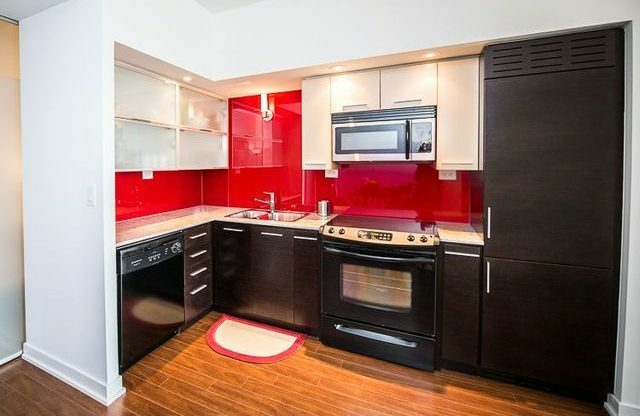 The kitchen sits opposite the living room and maintains a striking contrast of whites, blacks, and reds. The area is complete with full-size appliances including a stove, fridge, dishwasher, and microwave. Having a full sized kitchen makes living in the city much easier as you do not have to go out every day for every meal. In fact, this space is perfect for hosting a couple of friends. The bedrooms are similarly designed upholding two fully fitted queen sized beds, spacious closets, and end table lighting. 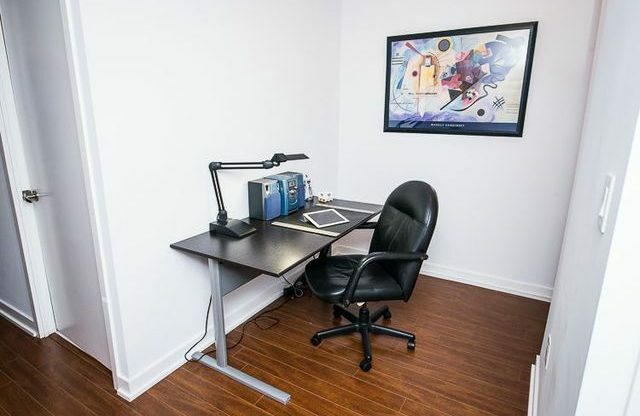 There is a private workspace that easily doubles as a den complete with a dark wood desk and leather office chair. The bathrooms are extremely well-kept. 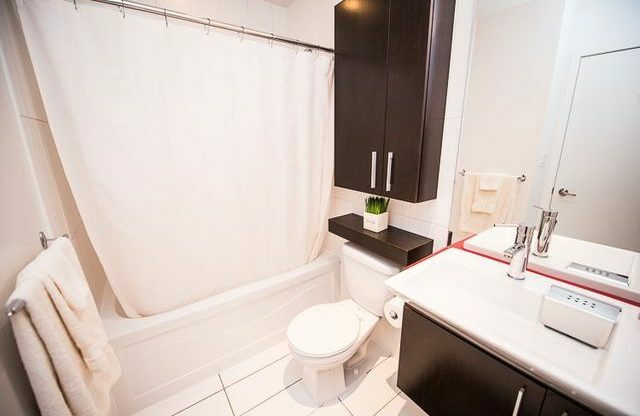 They boast spotless interiors, porcelain furnishings, and full baths. 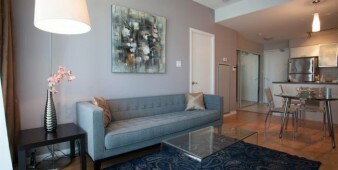 Guests who are intrigued by the Luna C-suite might also be interested in other 2-bedroom rentals that Sky View offers. 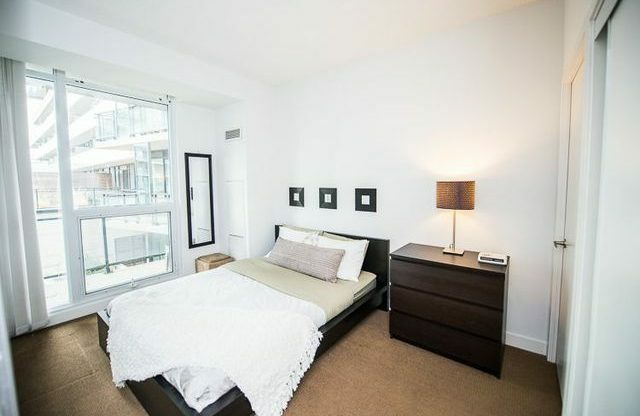 This 2-bedrom unit is in a great location in downtown Toronto. 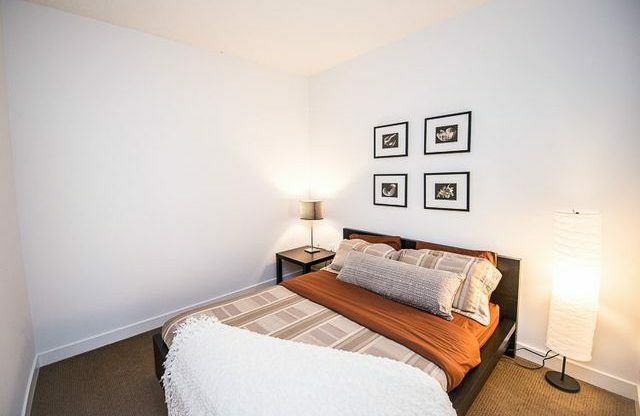 As a guest of this unit, you will be awarded the opportunity to experience both city and natural life. This is due to the proximity of the waterfront. 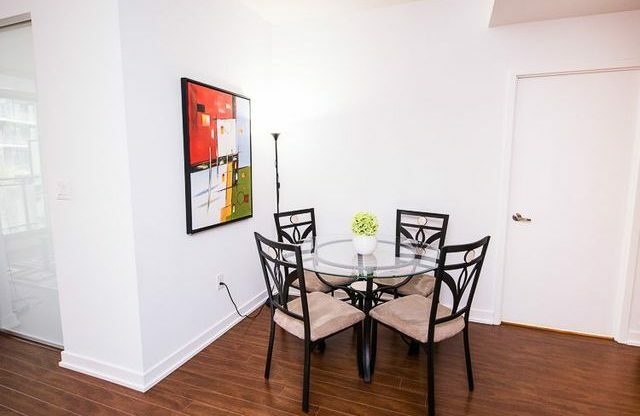 This furnished rental puts you right in the heart of down Toronto. 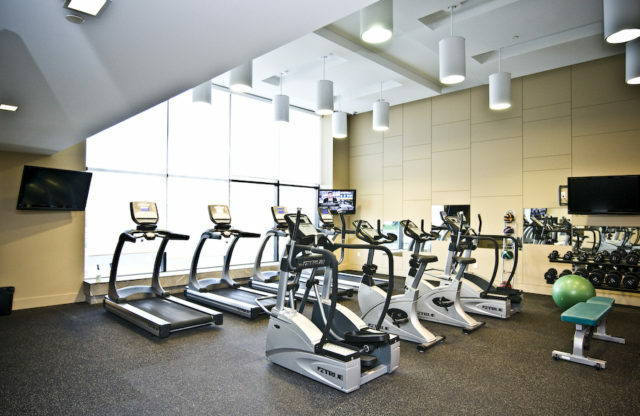 Find yourself a short distance away from the Roger’s Centre. This iconic stadium is home to the Infamous Toronto Blue Jays, Canada’s only Major League Baseball team. The St. Louis Bar & Grill, sits just outside the stadium and is a hotspot pub. This informal offshoot chain serves slow-roasted ribs, wings spiced to order, and other pub grub. It is a great place to get some much-needed comfort food during your extended stay. You can also travel just down the street from the Rogers Centre to find Toronto’s most famous landmark the CN tower. It is the second tallest free-standing building in the world. Beside the CN tower is the newly appointed Ripley’s Aquarium of Canada. This splendid location boasts a variety of different fish species including; sharks and octopi. 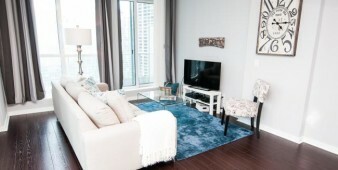 Sky View offers their suites in the most popular areas of downtown Toronto. These areas are often the most highly sought after for their proximity to transit, entertainment and essentials such as grocers and pharmacies. By places our guests in these areas, Sky View Suites ensures that furnished rentals guests will have an unmatched Toronto experience. 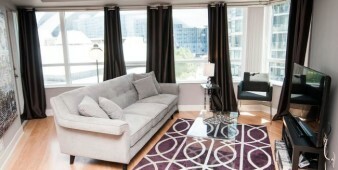 The host building for this beautifully furnished rental is none other than Luna condos. This fabulous and chic building offers is guests a host of amenities to further enhance their stay. 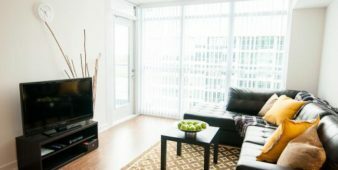 They include; a rooftop saltwater pool, whirlpool and patio as well as a theatre room for 20 with stadium seating and projection, two sets of locker rooms including saunas and steam rooms, a billiards room, 2 fully furnished guest suites, a party room, a conference room, dance/yoga studio, a cards/dining room, and fitness classes. 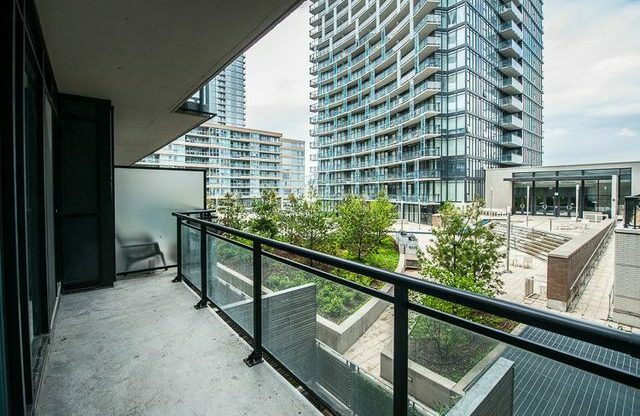 If that wasn’t enough to convince when you rent a furnished apartment in Toronto through Sky View you will also be awarded all the benefits that Sky View provides. 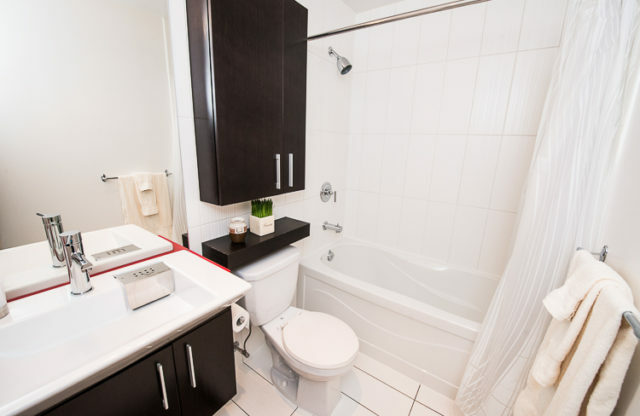 This includes; wireless internet, cable TV, a fully equipped kitchen, ensuite washer/dryer, bi-weekly cleaning service, and parking. All of these unbelievable services are provided at no additional cost. 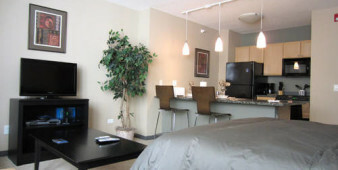 This makes your extended stay rentals a cost effective alternative to traditional hotel room rentals.